If you wish to make comments or file bugs regarding this document in a manner that is tracked by the W3C, please submit them via our public bug database. This document was published by the HTML Working Group as an Editor's Draft. If you wish to make comments regarding this document, please send them to public-html-media@w3.org (subscribe, archives). All comments are welcome. This document is governed by the 1 August 2014 W3C Process Document. The decode timestamp indicates the latest time at which the frame needs to be decoded assuming instantaneous decoding and rendering of this and any dependant frames (this is equal to the presentation timestamp of the earliest frame, in presentation order, that is dependant on this frame). If frames can be decoded out of presentation order, then the decode timestamp must be present in or derivable from the byte stream. The user agent must run the end of stream algorithm with the error parameter set to "decode" if this is not the case. 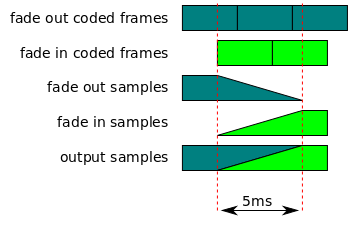 If frames cannot be decoded out of presentation order and a decode timestamp is not present in the byte stream, then the decode timestamp is equal to the presentation timestamp. 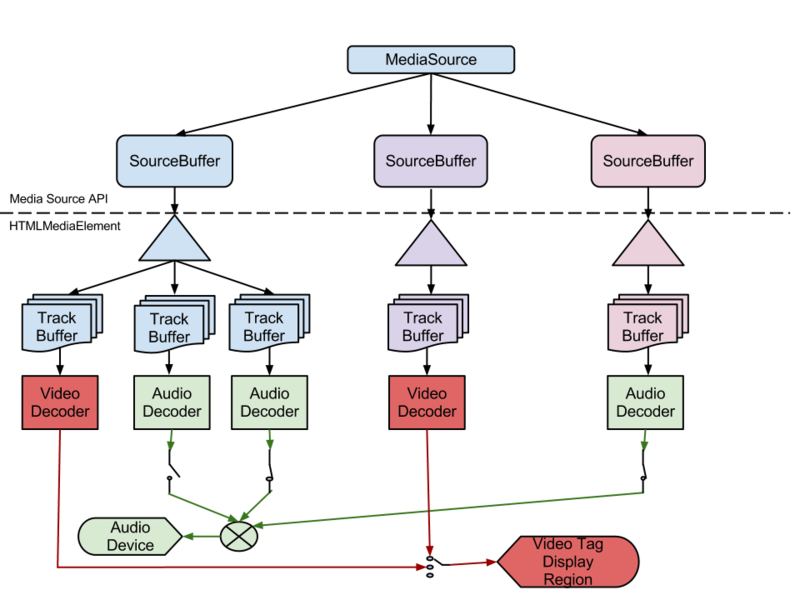 A byte stream format specific structure that provides the Track ID, codec configuration, and other metadata for a single track. Each track description inside a single initialization segment has a unique Track ID. The user agent must run the end of stream algorithm with the error parameter set to "decode" if the Track ID is not unique within the initialization segment . If the value being set is negative or NaN then throw an InvalidAccessError exception and abort these steps. If type is an empty string then throw an InvalidAccessError exception and abort these steps. If the mode attribute on the TextTrack object is set to "showing" or "hidden" , then set the removed enabled text track flag to true. If the new duration is less than old duration, then run the range removal algorithm with new duration and old duration as the start and end of the removal range. This preserves audio frames and text cues that start before and end after the duration. If updating equals true, then run the append error algorithm. If the new value equals NaN, then throw an InvalidAccessError and abort these steps. If the new value is less than or equal to appendWindowStart then throw an InvalidAccessError exception and abort these steps. If the new value is less than 0 or greater than or equal to appendWindowEnd then throw an InvalidAccessError exception and abort these steps. If generate timestamps flag equals true and new mode equals "segments", then throw an InvalidAccessError exception and abort these steps. If duration equals NaN, then throw an InvalidAccessError exception and abort these steps. If start is negative or greater than duration, then throw an InvalidAccessError exception and abort these steps. If end is less than or equal to start or end equals NaN, then throw an InvalidAccessError exception and abort these steps. Each track buffer has a highest presentation timestamp variable that stores the highest presentation timestamp encountered in a coded frame appended in the current coded frame group. The variable is initially unset to indicate that no coded frames have been appended yet. If the input buffer contains bytes that violate the SourceBuffer byte stream format specification, then run the end of stream algorithm with the error parameter set to "decode" and abort this algorithm. If the first initialization segment received flag is false, then run the end of stream algorithm with the error parameter set to "decode" and abort this algorithm. If the HTMLMediaElement.error attribute is not null. then throw an InvalidStateError exception and abort these steps. If stream.state equals "errored", then run the append error algorithm and abort this algorithm. If stream.state does not equal "readable", then run the append error algorithm and abort this algorithm. If data is not an ArrayBuffer or an ArrayBufferView then, run the append error algorithm and abort this algorithm. If the initialization segment has no audio, video, or text tracks, then run the end of stream algorithm with the error parameter set to "decode" and abort these steps. Verify the following properties. If any of the checks fail then run the end of stream algorithm with the error parameter set to "decode" and abort these steps. If the initialization segment contains tracks with codecs the user agent does not support, then run the end of stream algorithm with the error parameter set to "decode" and abort these steps. Let overlapped frame presentation timestamp equal the presentation timestamp of overlapped frame. Let remove window timestamp equal overlapped frame presentation timestamp plus 1 microsecond. If the presentation timestamp is less than the remove window timestamp, then remove overlapped frame and any coded frames that depend on it from track buffer. Remove all coded frames between the coded frames removed in the previous step and the next random access point after those removed frames. Remove all coded frames from this track buffer that have decoding dependencies on the coded frames removed in the previous step. For example if an I-frame is removed in the previous step, then all P-frames & B-frames that depend on that I-frame should be removed from this track buffer. If language is not an empty string and language is not a BCP 47 language tag, then throw an InvalidAccessError and abort these steps. If trackDefaults contains two or more TrackDefault objects with the same type and the same byteStreamTrackID, then throw an InvalidAccessError and abort these steps. Store a copy of trackDefaults in this new object so the values can be returned by the accessor methods. The editors would like to thank Alex Giladi, Bob Lund, Chris Poole, Cyril Concolato, David Dorwin, David Singer, Duncan Rowden, Frank Galligan, Glenn Adams, Jer Noble, Jerry Smith, Joe Steele, John Simmons, Kevin Streeter, Mark Vickers, Matt Ward, Matt Wolenetz, Matthew Gregan, Michael Thornburgh, Philip Jägenstedt, Pierre Lemieux, Ralph Giles, Steven Robertson, and Tatsuya Igarashi for their contributions to this specification. See a problem? Select text and .